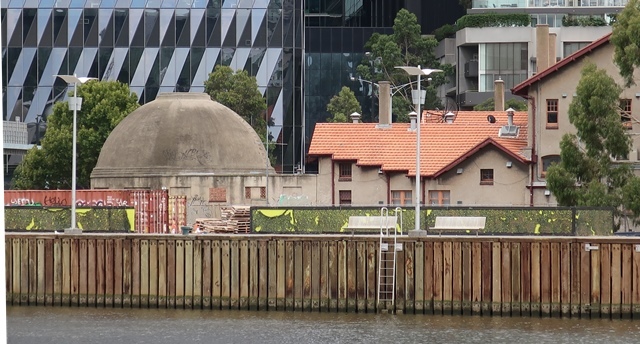 The domed building sits to one side of the Mission to Seafarers – apart but connected. The concrete dome contrasts with the red tiled roof and more domestic looking Mission buildings designed by Walter Butler. Funds to build a gymnasium for seafarers when in Port was raised by members of the Ladies’ Harbour Lights Guild. Some of those fundraising events took place at Norla, the home of Sir Simon and Lady Fraser in Irving Road, Toorak.1 The Norla Dome opened shortly after the rest of the Mission, after the war, in 1920. Now the Norla Dome is used for exhibitions and as a function space. Fundraising remains a central part of the work of the Mission to support their continuing work for seafarers who are away from home for months at a time and in Port only briefly. Loneliness and isolation are major issues facing seafarers today. Muted traffic noise intrudes from Flinders St but with no windows to the outside it feels like a sanctuary. The exposed brick walls contrast with the render on the outside of the building. Hooks in the ceiling are the sole reminder of its former use as a gymnasium. Stand in the centre of the Dome, and it is if standing at an invisible lectern with a microphone. Light enters the space through an oculus. 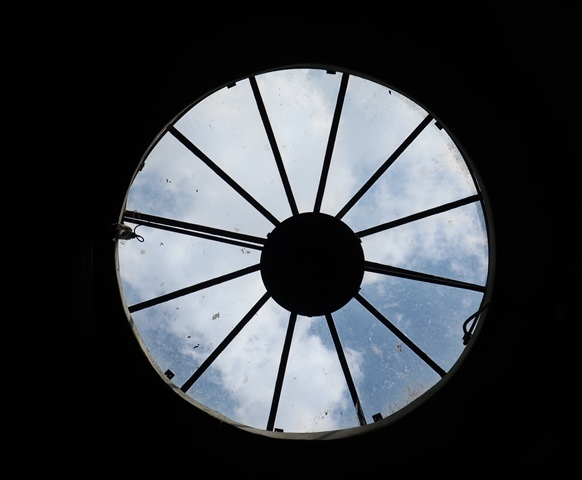 The Norla Dome is a most unusual and precious place. What lies ahead for the Norla Dome? The Mission buildings are adjacent to, but separate from, the Riverlee development of Northbank and Goods Shed No 5. Riverleee has already restored the heritage protected Malcolm Moore crane as part of its public benefit contribution. The decaying wharf has also been restored as can be seen in the first photograph. Work is likely to begin soon on the development itself after the project was approved by the Minister for Planning on 21 July 2018. 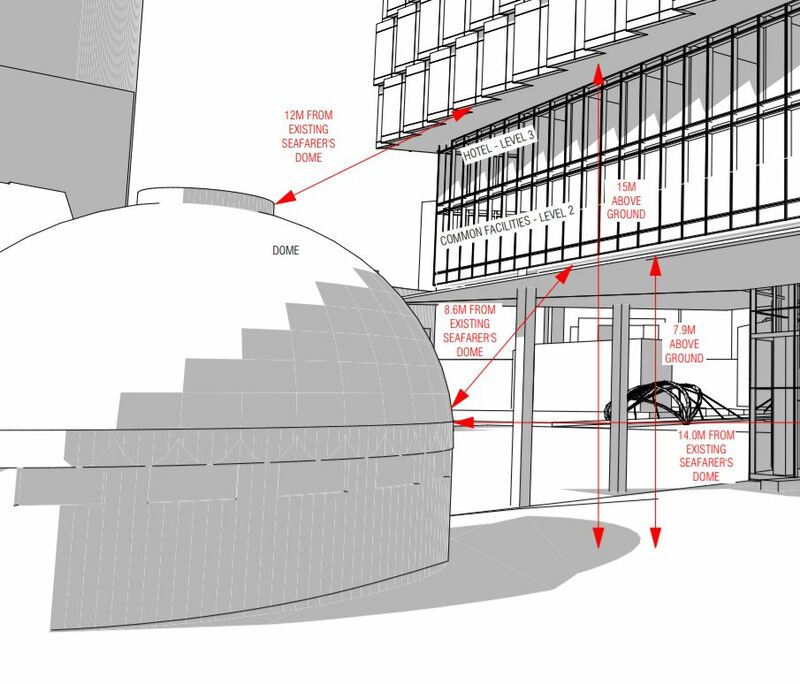 These diagrams from the town planning documents presented to the City of Melbourne in February last year show the separation between the new development and the dome. Insufficient, in my view. This quaint and unusual structure would look best with generous space around it – like the observatory at the Royal Botanic Gardens. Soon these diagrams will take concrete form. While the processes not visible to the public unfold that will enable the development to proceed, Goods Shed No 5 and the space to be occupied by the development are being used for car parking. On the Australia Day public holiday, a man on a bicycle arrived to feed the seagulls. They anticipated his arrival, flocking from the shed roof. Also as part of Riverlee’s development contribution, a new public park will be created between the Mission and the River to be called Seafarers Rest Park. The Park is being designed by landscape architects Oculus. 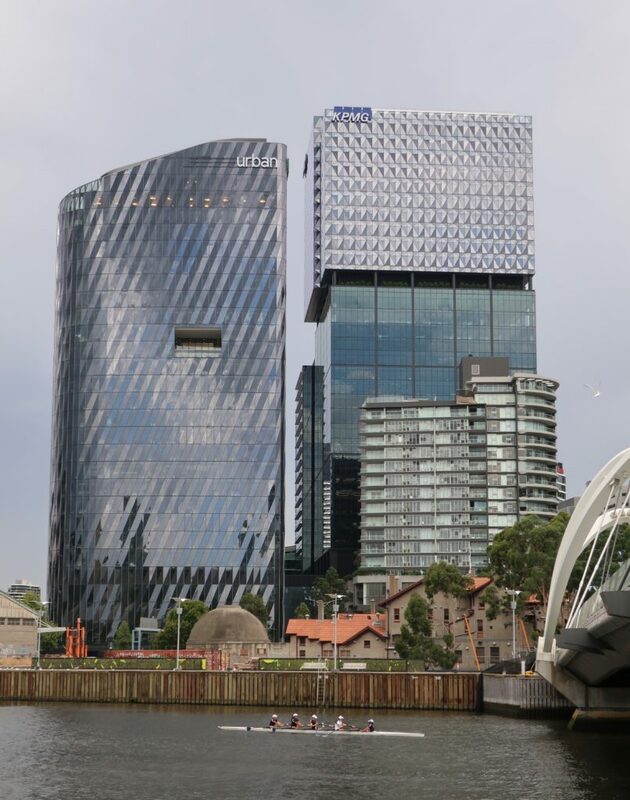 It is reassuring that Oculus will be responsible for the design of all the public spaces between Wurrundjeri Way and the Seafarers Bridge since together with Cox architects, Oculus designed the fantastic Jim Stynes Bridge which weaves underneath Wurrundjeri Way. Oculus also created the exuberant Port themed Maritime Cove playspace in Port Melbourne suggesting they may be receptive to interpreting the Port in the new Seafarers Rest Park. Follow the Seafarers Rest Park project page on Participate Melbourne website.